If you haven’t read “Morihei Ueshiba, Budo and Kamae” yet then you’ll probably want to go back and read that article first. 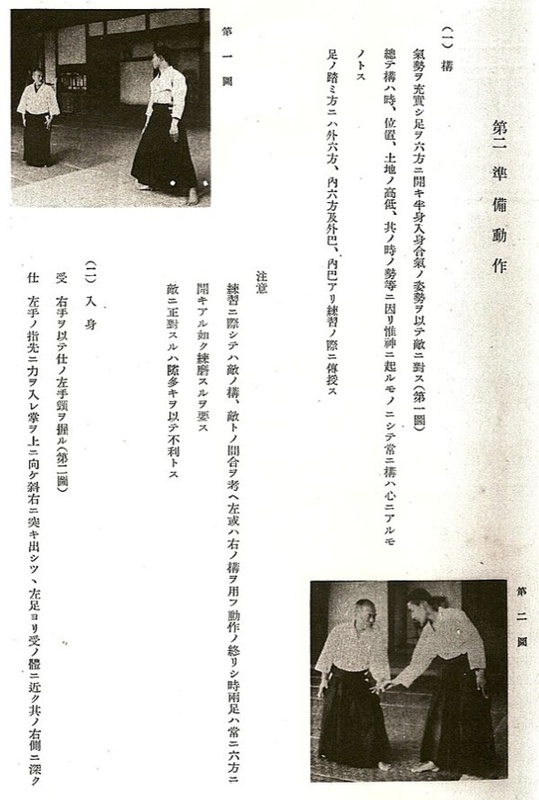 You may also want to read “Morihei Ueshiba, Budo and Kamae – Part 2“, which contains a response from John Stevens to the original article. Now, take a look at the section above, “Tai-no-henka to the left and right”, scanned from Morihei Ueshiba O-Sensei’s 1938 technical manual “Budo”. After tai-no-henka (“body change”) you must open both legs in six directions (“roppo”) to stabilize your stance. There are those pesky six directions again, noted in the previous articles. This time note that Aikido Founder Morihei Ueshiba specifies six directions for the purpose of stability. Of course, “six directions” is commonly used in Asian cultures to mean “all directions” – up/down/forward/back/left/right. In and of itself, you can see that something that is balanced in all directions at the same time is inherently stable. Exptrapolating further, something that is stable, and balanced in all directions, is also able to move in any direction, or to respond to a force from any direction. I had tried many times to move or strike him, but had no success. Kicks, strikes, entering in – they were all useless. After repeated failed attempts! I gave up. Laughing and panting for air, I asked, “What am I missing?” According to Sifu, I was missing an important piece of my foundation . In short. I could not enter his “spheres” – that is to say. I could not penetrate Master Chin’s defensive energy. 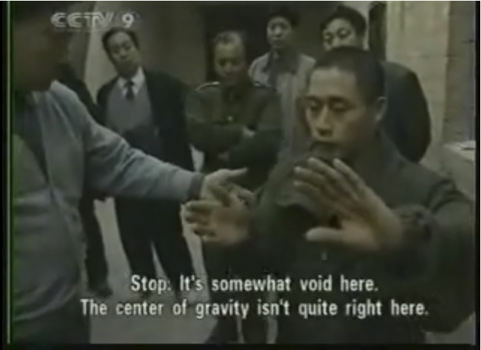 Since that first encounter I have come to learn that what Master Chin called “the spheres” is closely connected to an energy named peng-jing (掤勁). Literally translated, peng means “ward-off” and jing means applied energy. Although peng-jing can also refer to a particular technique, it more accurately refers to the basic energy of dynamic balance. Six directions creates a state in which a dynamic stability is achieved through balanced forces, and one is able to move in any direction at any time. This article by Zhang Yun gives an additional look at Six Direction force, as used in Xingyi Quan, and notes that six directions practice is essential to the development of Jin (勁, a “skilled” force – usually referring to types of internal power). 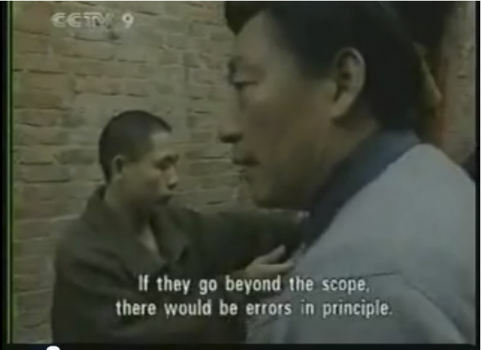 And here is another perspective on six directions, this time from Yi Quan, expressed as Liu Mian Mo Li (六面摸力), a force equally balanced through your body in six directions. Liu Mian Mo Li (六面摸力) is developed through six directions in three pairs of contradictory directions – up/down, back/forward, left/right. The contradictory directions connected by intent create Mao Dun Zheng Li (矛盾争力, opposing force pairs). 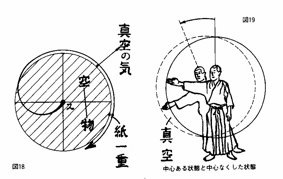 As in Yi Quan, opposing forces around the circle are connected in Aikido. 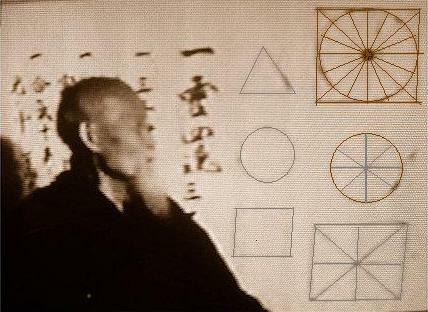 In “Aikido without Peace or Harmony” we saw that Morihei Ueshiba stated that this connection between opposing forces, formed by Ki, forms the basis for “Take Musu”. In this thing called Aiki, first describe (draw) a circle. Drawing a circle is, in other words, opposing powers. Without touching with even one finger your opponent will be sent flying. Just to be able to do this one thing takes about 10 years. Let’s try to advance quickly. Of course, we can see the stability in the examples above, but how does six directions (or the lack of them) contribute to being sent flying? Draw a circle around a person’s power with the person in the center. Inside the circle is the limit of their range of power. No matter how physically strong the person is, outside the circle they will not be able to reach their power and they will become powerless. For that reason, when that power is made unreachable outside the circle and you hold them down your opponent will already be without power, and you can hold them down easily with an index finger or a pinky. If I remain inside my own circle while drawing the opponent outside of my opponent’s circle then it will all be decided (“it will all be over”). Now, here’s a drawing by Bansen Tanaka (who started training with Morihei Ueshiba in 1936 in Osaka) from a privately published book (the diagram on the left side was mentioned in “Aikido and the Structure of the Universe“), “Aikido Shinzui”, published in 1976 (no relation to the later work published by the Aikikai). 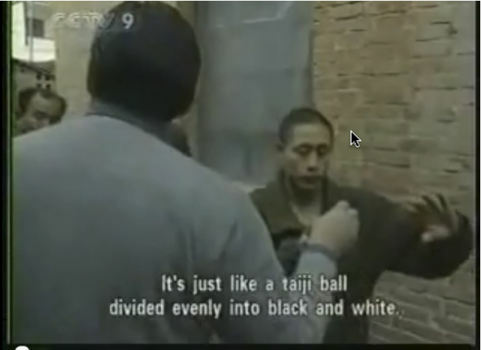 Here we see the Taiji ball on the left side – the Kanji at the top right of that diagram read “The Void”. The Kanji on the bottom right read (“the thickness of a single piece of paper”). The Kanji in the right side of that diagram read “Emptiness” and “Matter” (i.e. “Heaven” and “Earth”, In and Yo opposing powers). A lot of things are said, such as Aiki is a circle, or centrifugal/centripetal force, but it’s nothing like that. If you are speaking of strength, it is a matter of slightly slipping out of the circle. If you slip slightly out of the circle and unfasten the endpoint of their power it will dissappear. Which contains very clear echoes of the statements from Morihei Ueshiba and Chen Xiaowang, only this time from a Daito-ryu instructor. once again thank you very much for a most elucidating contribution to a deeper understanding of the essence of aikido. Being a novice in the art with a mere 25 years of aikido practice, I have only very little to contribute, but would nonetheless be happy to chip in with what little I have. 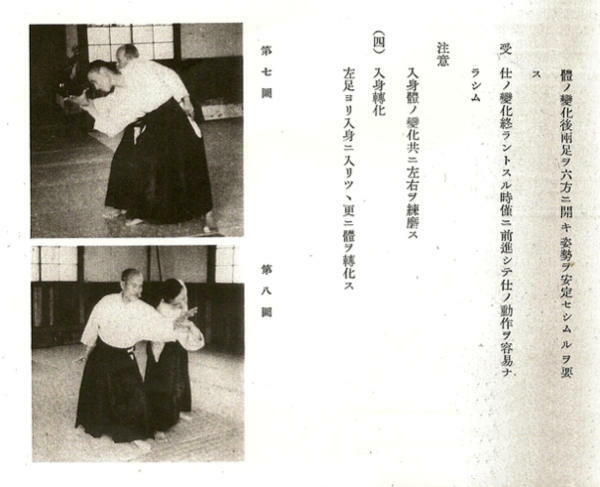 Since I began aikido in 1991, my main “style” has been (and will remain) Aikikai. Nonetheless, I have spent three years of cross-training in Shin Shin To Itsu Aikido (Tohei Sensei’s style) and so far four years of adding Daito-ryu Aikijujutsu (Okamoto Sensei’s style) practice to my attempts and understanding the finer points. From my background in these facets I have two observations that might be of interest. As people familiar with Tohei Sensei’s approach will know, much emphasis is placed here on structural integrity and on the extension of ki. A regular exercise to promote this is the Six Directions exercise: Stand in a balanced fashion and be mindful of your One Point. Then, expand your awareness through the top of your head, so that you “feel” it touching the ceiling. Increase the sensitivity in the soles of your feet so that you become glued to the floor. Extend your arms sideways and mentally “touch” the walls with the fingertips of each hand. Finally, let your eyes focus on the wall in front of you until it feels like you are actually standing an inch away – while increasing the sensitivity of the back of your head until it feels like you are “touching” the wall behind you. Then, your partner can test your centeredness. This was explained to me as one of the most powerful basic exercises for becoming centered in regard to all the Six Directions. People familiar with (the now sadly also late) Okamoto Sensei will be quite aware of the fact that he named his school “Roppokai”, which was clarified as referring to the Six Directions, since being able to lead your opponent by moving your point of contact up, down, left, right, forwards, and backwards as required, was the essence of Okamoto Sensei’s approach. I am saddened to see John Stevens mar his otherwise respectable account with a sneer of needless, condescending arrogance, discrediting himself not only by his tone, but also by the inadmissibility of his argument. The gist of his point is that his lineage through his teacher Shirata Sensei puts him two degrees from O-Sensei himself – which, apparently, makes John Stevens as infallible as the Pope, and by the same argument (the line of popes going back to St. Peter, who was taught by Jesus himself). You, however, being outside this direct line of transmission, are approaching heresy. To explicitly derogate you as an unqualified teacher on no grounds whatsoever (except for said, truly inane postulate) is, I hope, nothing more than a (severe!) lapse of reason on Stevens’ part. 1) Stevens failed to grasp the essense of O-Sensei’s writings. He argues that this is not the case, since he had the help of Shirata Sensei when translating the text, and Shirata understood all O-Sensei’s points completely. 2) Stevens is right, and Shirata Sensei was right, and you are wrong. Obviously, in a book designed to assist his students, O-Sensei then deliberately obscured this point by incomprehensible phrasing – for security reasons, no doubt, in case the text fall into the wrong hands! Apparently, none of the other points he made were so dangerous as to merit obfuscation …? 3) Stevens is right, and Shirata Sensei was right, and you are wrong. But you are in good company, since O-Sensei himself was unable to express himself competently! Lucky for the world that Shirata Sensei, and Stevens, were around to explain what O-Sensei could not. 4) O-Sensei wrote exactly what he intended to write. However, as is common knowledge in aikido circles, his finer points were not always grasped by all his students, as they themselves have admitted on numerous occasions. It is possible, then, that even Shirata Sensei did not understand every point O-Sensei ever made, and that this was one of the points even Shirata Sensei did not grasp. In that case, Stevens’ translation is the result of a simple misunderstanding, passed from teacher (Shirata Sensei) to student (Stevens) – which, in my view, would be a perfectly forgivable occurrence. Stevens’ very unsound reaction to your findings, then, would be an attempt, however misguided and unbecoming, to protect his teacher’s reputation. For what? Infallibility? I do not pretend to know whether Shirata Sensei was infallible (which would be a first in human history). Nor do I pretend to know whether Shirata Sensei believed himself to be infallible (which, sadly enough, would not be a first in human history). I do not even pretend to know whether Shirata Sensei would be pleased at his former student’s attempt to cover up a possible mistake of Shirata Sensei’s – or whether he would feel ashamed at Stevens’ uncouth behaviour in this case. I do, however, pretend to know – from his own guidelines in regard to the practice of aikido – that O-Sensei’s wish for all his students (and, it must be assumed, their students as well) was that they would understand that a teacher only has the opportunity to transmit so much knowledge, and that they have to discover the rest by ceaseless practice and reflection. And I do not doubt for a minute that if O-Sensei were around to see your efforts and your writings, and the way you share your thoughts and discoveries with the rest of us – he would definitely be very pleased at your endeavours! Thanks Christian. Yes, it’s certainly a complicated process. Of course, nobody is even infallible – the more information (and versions of translations) that we can get out into the world the better the chances are that we (and everybody else) will be able to make informed decisions!